Last Christmas my friend, Heather, put together a gift for me that I will treasure forever. She bought me a Living Locket by Origami Owl and it couldn't be more perfect for me! 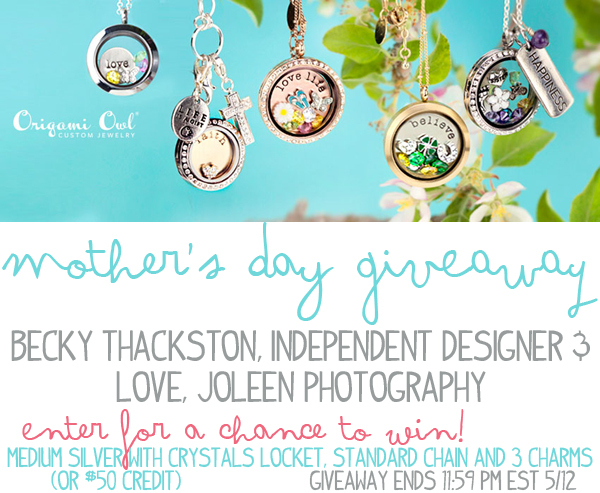 Recently, I connected with Independent Designer, Becky Thackston, who is here today to tell us about Origami Owl and offer a sweet GIVEAWAY in honor of Mother's Day to Love, Joleen readers! Welcome, Becky! The founder of Origami Owl, Bella, began the company in 2010. She was just 14 years old and started with a simple goal to earn enough money to buy a car for her 16th birthday. At the beginning she sold Living Lockets at home parties and events. As the word spread about this unique jewelry, she continually heard from women who wanted to know how they could bring Origami Owl to their family and friends. Today we proudly partner with thousands of woman across the country who run their own Origami Owl businesses. Our team of Independent Designers includes girls as young as 14, women who are well into their golden years and everyone in between. Behind every piece of Origami Owl jewelry is a woman with a unique, one-of-a-kind story. Each personalized creation serves as a reminder of who you are, where you have been, where you are going and the dreams you carry in your heart. 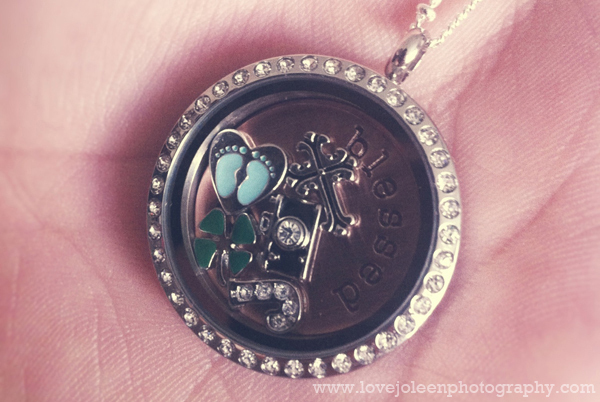 A little bit about my personal locket/story....my locket I hold dear to my heart and wear every day. Inside my locket I have 5 simple charms: the aqua stone (simply because I love blue) - the February round birthstone (for my granddaughters birthday) - the cross (to represent my spiritual side) - artist palette (for my creative artsy side) - and finally the crystal butterfly (which represents my grandmother who I lost 6 years ago). What would your story be? As an added bonus I am giving away a chance to win a locket valued at $50. 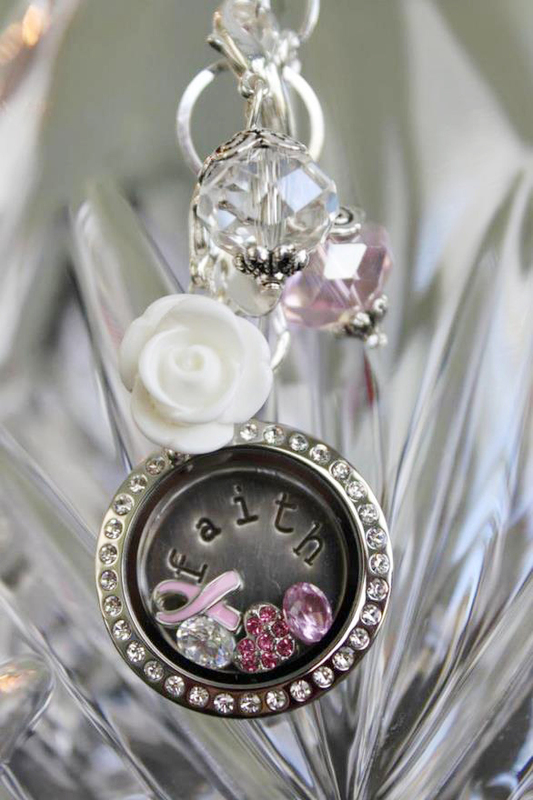 (medium silver with crystals locket, standard chain and 3 charms). If you win, you may upgrade your locket or add more charms....you will be responsible for the difference above and beyond $50. Make sure to LIKE my facebook page if you get a chance so that you can stay in touch with new happenings and locket ideas. And if you would love to be added to my newsletter.....just leave your email address and I will get you added. 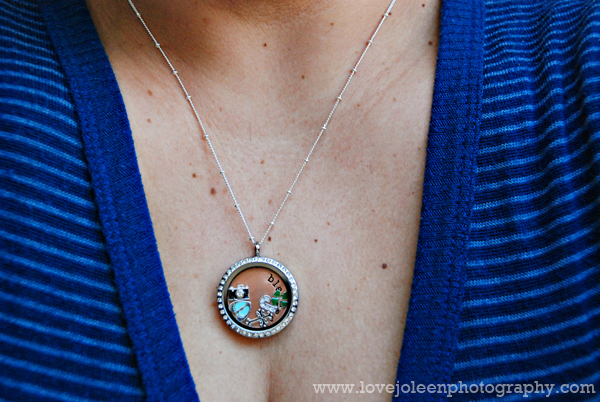 *I am currently hosting my own Living Locket party! Check out the catalog online. Want to place an order? Just follow the website link and at check out, under Party ID, look for Joleen's party!